Pay $300 to scan about 6,000 photos with free S&H and same day service - that's about five-cents per scan when you get the free extra box (3 for 2 - the 3rd box is free, plus and extra 10% off, up to $25). At checkout, use this promo code: "Twitter"
Also use the "Twitter" 10% discount promo code for all online photo print, photo album and greeting card orders at the ScanMyPhotos.com online photo center. Mention Twitter to also save 10% towards all future in-store Kodak photo kiosk order at our Irvine, Calif.-based retail photo center. 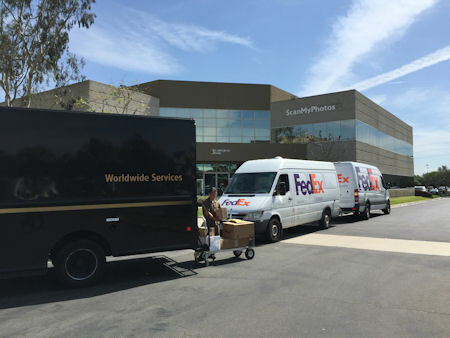 Since 1990, all photo imaging orders have been processed, fulfilled and mailed back from Orange County, Calif. Before ordering, use our free 24/7 Live Support help desk to instantly help answer any questions. Click here. *Discounts cannot be applied to previously placed orders and some restrictions apply.